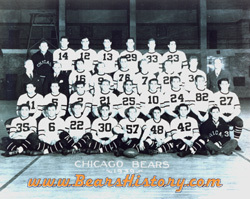 The 1939 Chicago Bears team photo included rookies such as Sid Luckman (42) that would become stars and Hall of Famers. For many Americans, the year 1929 ushered in the darkest era in their lifetimes, as the infamous stock market crash in October of that year signaled the beginning of the Great Depression. Although it took a world war on a scale never before seen to truly fix the economy, it steadily improved through the decade of the 1930’s. Likewise, the fortunes of the Chicago Bears Football Club hit a low point in the year 1929 when the team finished with a losing record (4-9) for the first time in their history. To say the Bears also steadily improved through the decade would technically be correct, but would minimize the accomplishment of the warriors the team fielded in the early 1930’s. Simply put, the 1930’s Bears revolutionized the game and morphed into another team ready to take the league by storm again the following decade. Following the 1929 season, Chicago Bears co-owners and coaches George Halas and Dutch Sternaman decided to turn their coaching duties over to someone else for the first time, and also gave up playing on the field. They wanted to focus their attentions on running the business, which was becoming more challenging given the state of the American economy. Halas reached back into his roots when he hired Illinois assistant coach Ralph Jones to be the team’s first “non-Halas” head coach. Upon his hiring, Jones boldly promised Halas he would bring the owner a championship within three years. Jones didn’t waste any time jumping into the task at hand. Halas believed that the Bears had become boring and predictable on offense at times, so Jones invested a lot of time retooling that side of the line. To that point football was mostly an up-the-middle power game, so Jones worked on opening things up. He first lined the quarterback directly under center, the first time this had been done. Next, he spaced out the offensive line and devised blocking schemes that would open holes in the defense. This allowed star halfback Red Grange-and rookie Bronko Nagurski-to scoot through the line to daylight. Plays were even devised for “The Bronk” to fake a run and throw a jump-pass. In the first season of the new decade, the Bears finished 9-4-1. Although they defeated Green Bay in the season’s final game, the Packers were awarded the league championship for having a better overall record than the Bears. In 1931, the Bears finished 8-5, but bigger news developed during the offseasons both prior and after that campaign. With the Great Depression in full swing, Halas’ partner Dutch Sternaman wanted out. Not heavy on cash himself, Halas needed to scrape together every dime he had, plus money from private investors, to buy out Sternaman’s share for $38,000. The two owners drafted a plan for Halas to pay his co-founder $25,000 in July 1931, and two further payments in January and July of 1932. The fine print stated that were Halas unable to fulfill terms of the deal, full ownership of the club would revert to Sternaman at Noon on August 9, 1932. Halas later told biographers that he thought the fine print in the contract was merely “legal hocus-pocus,” but when August 9th dawned he found out differently. $5,000 short of the payment to Sternaman and out of resources, he seemed resigned to the fact that he would lose his “beloved Bears.” By chance at 11 a.m., C.K. Anderson, president of a bank in Antioch, IL called and agreed to loan Halas the remaining $5,000. The new full owner had just enough time to get the money and run to the office of Sternaman’s lawyer. With financial matters now settled, the 1932 Bears embarked on helping Jones fulfill his promise to Halas, to win a championship within three years. The team started the season with three ties and a 2-0 loss at Green Bay, but unbeknownst to all would not lose another game for 16 straight weeks. After beating the Staten Island Stapletons 27-7 on October 23, Chicago tied three more games but also won five to finish the regular season 6-1-6 (ties were not counted in the standings, a practice that continued in the NFL for decades). With incredibly brutal weather bearing down on Chicago, the Bears were set to host the Portsmouth Spartans (later to become the Detroit Lions) for the NFL Championship. Due to the unrelenting conditions, the teams agreed to play the game inside Chicago Stadium. This had also been done as an exhibition in 1930, luckily. The Bears were also fortunate to learn that the Spartans’ star player, quarterback Dutch Clark, could not play in the game, as he was due to start his offseason job. On an 80-yard field covered in mud and animal dung (the circus had been in town), Chicago won its second championship by defeating Portsmouth 9-0. Having kept his promise to Halas, Jones left the Bears to become athletic director at Lake Forest College in that Illinois town. Halas decided to take the team back over as coach for “a few more years”, and the team didn’t miss a beat. That would be an understatement, as the team won six more games before losing, putting their unbeaten streak at 16 weeks. The team finished the 1933 season with four straight wins, then a championship game victory over the New York Giants in Chicago. The Bears were now NFL Champions two years in a row. Chicago finished the ’33 season with five straight wins, then swept through the 1934 season a perfect 13-0. That Bears team held the record for most consecutive victories-18-until it was broken during the 2004 season by the New England Patriots. In a championship game rematch, this time at New York against the Giants, the Bears were embarrassed 30-13. The game was played on an ice-coated field, and at halftime the Giants changed to running shoes, which they felt gave them more traction than cleats. After the loss, Halas vowed never to play without a full change of shoes available for his team. From 1935-1938, the Bears compiled a 30-13-3 record but didn’t win any championships. Red Grange had retired following the 1934 campaign, Nagurski left after 1937 (he would make a brief re-appearance the following decade), and the team also lost Bill Hewitt and Beattie Feathers, the first running back in history to rush for 1,000 yards in a season. The NFL draft began in 1936. In 1938 and ’39, Halas hired University of Chicago head coach Clark Shaughnessy to share some of his offensive ideas with the Bears. In the process, Halas’ club revamped its attack, changing the classic “T-Formation” (this formation was long used in college and pro football, the Bears simply refined it in the 40’s) into a scoring machine. To help with this transformation, in 1939 Halas traded with Pittsburgh to acquire an extra first-round pick, and drafted quarterback Sid Luckman from Columbia. Next he picked back Bill Osmanski, and during that season, the team won their final four games, scoring 27 points per game on the year, and were poised to dominate the league in the next decade. George Halas and Dutch Sternaman turned over coaching duties to Ralph Jones in 1930. Jones gave the owners one championship, in 1933, then retired. Halas' team won another championship in 1933. The Bears did not lose a game between October 17, 1932 and November 4, 1933. During this period their record was 13-0-3. Halas remarkably became sole owner of the Bears in 1932, when he barely made a Noon deadline to buy out Sternaman. Were he a minute late, he would have given up his shares in the team to his former partner. By the end of the decade, Halas needed to overhaul the team, and the 1939 draft landed him a future Hall of Fame quarterback in Sid Luckman, among others.